Yesterday marked the beginning of Google’s mobile algorithm change – and while it is scheduled to take a full week to completly roll out, we’re monitoring the results carefully at Mockingbird headquarters. We looked at data across 54 different law firm sites – 42 mobile optimized and 12 that weren’t – compared average daily mobile search traffic from the previous 8 weeks to the traffic on April 21st. In aggregate the volume of traffic to the non mobile sites was up by 1% compared to the mobile friendly sites’ 9% lift. 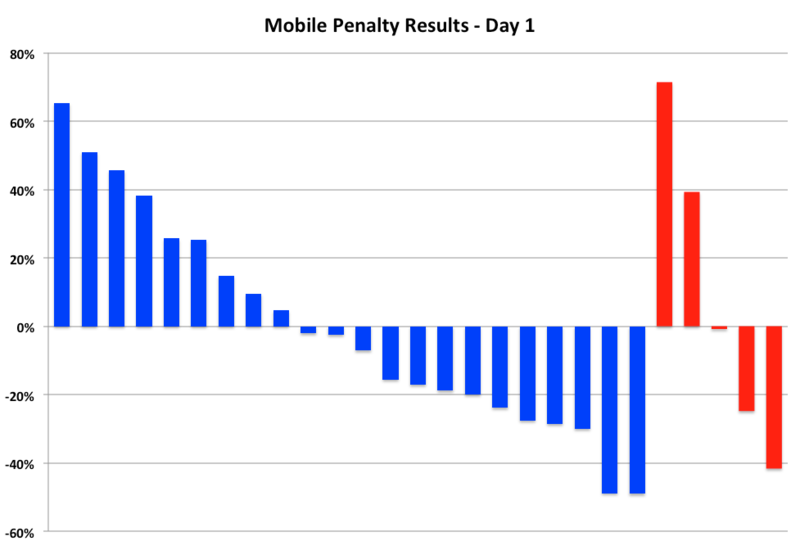 In the graph below – the blue bars are mobile friendly sites and the red bars are non mobile friendly sites. I’ve graphed the top half (as measured in traffic) of sites in our study, because the data sets below were so low that small changes had a large impact in the % change numbers. The roll-out is far from complete and we’re expecting more dramatic changes over the week. Law firm traffic tends to dip over the weekends and we compared a weekday against an average that included weekends – so there may be an artificially high change that won’t get worked out until we have a full week’s worth of data. A more accurate comparison will be a week’s worth of traffic once the roll-out has, well, rolled out. The conclusion? Stay tuned… this is just the beginning of what we expect to be a very bumpy ride.